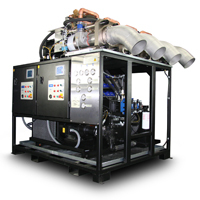 Cold Jet's dry ice production equipment has been engineered to extrude the highest density dry ice available. Due to our proprietary knowledge of dry ice, our process creates a longer shelf life, better transportability, and offers better blasting performance. Cold Jet pelletizers can be equipped with multiple dies to produce a range of extrusion sizes (3mm to 19mm available on most machines). From nuggets to pellets, Cold Jet Pelletizers offer a broad range of solutions. ›› To have Cold Jet contact you, please complete our Contact Form. 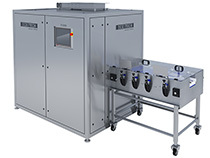 With minimal space requirements the PR120H is the end user’s answer for producing quality dry ice pellets on demand. 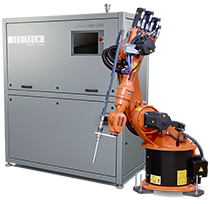 Our unique closed chamber technology ensures a quick startup and fast production time. 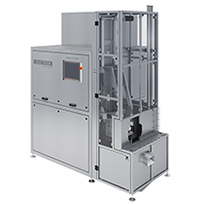 The PR120H can produce 120kg an hour of high quality dry ice pellets. The IceMaker PR350H presents a state of the art dry ice pelletizer packed with features for easier operation, swift production shifts and high capacity. The IceMaker PR750H represents a state of the art dry ice pelletizer packed with features for easier operation, swift production shifts and high capacity. 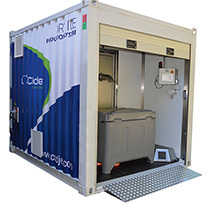 The Dry Ice Production Hub is either PR120H or PR350H pelletizer integrated with a 10ft High Cube ISO Transportable Container, capable of producing up to 120kg/265lbs or 350kg/772lbs of dry ice pellets per hour. 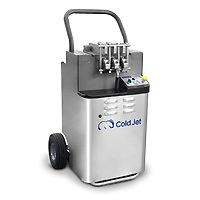 Cold Jet’s Dry Ice Production Hub is mobile and enables easy set up and handling of dry ice production. The system is ready to use by supplying electrical power and liquid CO2. As a mobile solution, it allows dry ice production in various facilities and in rugged, tough environments. With low ownership and maintenance costs, you can supply fresh, high quality dry ice on demand. The SL1000H offers a high quality, high volume, dry ice slices. The SL1000H is packed with features which translate into ease of operation and unparalleled economic productivity. Fast product changes, remote production management control and latest generation telemetry, combine to provide optimum output with minimal product losses. The i³ IcePress makes high quality blocks from any form (and any condition) of dry ice - wherever and whenever you need it. Use pellets, use old ice, use scrap ice - and make high quality blocks in as little as 3 minutes. The i³ IcePress is portable and all-pneumatic, so it can go where you go.